snowdeal.org > ex machina: the eric update - day 1091: the boy genius makes his poppi a card. the eric update - day 1091: the boy genius makes his poppi a card. 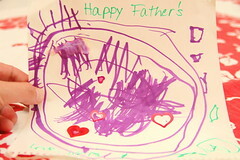 odin set out with the simple instructions from his mamma to make me an extra special card for father's day, which led to a wonderful abstract purply design. and when he was complete he ran to his mamma and asked her excitedly to come look at his creation while pointing out to the three letters he drew without aid and said slowly, "happy father's daaaaaay, d-a-y." while he's known his letters for quite some time and we've been having him practice writing his name with us slowly showing him how to write each letter, i do believe this is the very first time he's ever written a word with any help whatsoever.